Adrienne Shaw is an assistant professor in the Department of Media Studies and Production at Temple University and a Media and Communications PhD program faculty member. Her primary areas of interest are video games, gaming culture, the politics of representation, and qualitative audience research. I confess to having a love-hate relationship with Assassin’s Creed. Every game in the series is beautiful. The stunning landscapes, architectural and historical detail, acrobatic player-character and smooth (for the most part) gameplay are incredibly satisfying. Certainly there were many critiques of the repetitiveness of the first game. The modern-day component of the story and Matrix-esque Animus which acts as the deus ex machina to help explain why, as Desmond’s ancestor, the player can access databases full of historical information is arguably a bit cheesy (though no more so than most game narratives). In this essay I focus on Assassin’s Creed III (technically the fifth game in the series), which is set during the American Revolution. Needless to say there are many spoilers for the game below. In the interest of space, I have not included a summary of the game, though links and videos below provide some added detail. The main points to know: the main game player-character is Ratohnhaké:ton, or Connor, a member of the Kanien’kehá:ka (Mohawk) tribe; He is the son of Haytham Kenway (who is actually the player-character at the start of the game) and Kaniehti:io, or Ziio, (also a member of the aforementioned tribe); Achilles Davenport is the mentor who trains him to become an assassin. Moving out of the winding streets of the Crusades era Middle East and the rich architectural details of Renaissance Italy of the first two games, climbing the stark plainness of colonial Boston and New York is arguably less exciting even if it is accurate. AC III maintains the spirit of the series, however, in that it offers a critical look at history. Yet, in all the joy I get in playing these games, I cannot help but be irked by the way realism is used to deflect and preempt criticism while sidestepping the possibility of reimagining history more dramatically. AC III in particular feels pulled in many different directions when moments that are clearly rooted in a sensitive historical and cultural dialog appear alongside others that recreate tired tropes and assumptions about who is playing. The makers of the game are clearly conscious of the politics of representation embedded in the story they chose. AC III begins, like all games in the series, with a disclaimer: “Inspired by historical events and characters. This work of fiction was designed, developed, and produced by a multicultural team of various religious faiths and beliefs.” This statement is a holdover from the first game in the series, which was set in what is now called the Middle East during the Third Crusade. Even in AC II and its various supplementary games, the Catholic Church is central to the game’s conflict. In AC III, however, the series has moved to colonial New England during the American Revolution, making the emphasis of religion in the disclaimer seem odd (particularly as the religious beliefs of the Kanien’kehá:ka characters, colonists, and European forces in the game are rarely discussed or important to the plot). Thomas Deer, cultural liaison office at the Kahnawake Language and Culture Centre, is featured in many of these articles for his central role in ensuring a sensitive and accurate representation of Mohawk/Kahnawake language and culture. Scalping, for example, was a fight mechanic early in the game development that was eliminated when Deer pointed out that scalping was not a Mohawk practice (Plunkett). Consultants were necessary because, despite the disclaimer’s assertions of diversity, creative director Alex Hutchinson points out that: “There are people from all over the world on our team, but we’re very aware that we’re still pretty much a bunch of early-middle-aged white guys” (qtd. in Newman). Another, subtler goal of the disclaimer is to highlight one of the series’ most compelling features: its attention to authenticity, defined primarily through historical detail. Historical detail is indeed the underlying logic of the games’ settings. Lead Ubisoft producer of much of the series, Jade Raymond, says in one interview about the first game that it is “speculative fiction…By grounding a story in reality, you increase its credibility” (El-Nasr et al. 6). History in the game enriches the narrative in ways not always readily obvious. The play that is performed in the background of the assassination of Haytham completes at the start of the game, for example, is John Gay’s “The Beggar’s Opera.” It’s an interesting choice as the opera offers a critique of British nobility and government which actually helps set the stage for the revolution that takes up much of the rest of the game. All of this information is offered in the Animus database for any player who cares to read the small type. It would be easy to push back on the company’s claims of accuracy, moreover, by pointing out that Connor is voiced and modeled after a Crow actor, Noah Bulaagawish Watts (the other Kanien’kehá:ka characters are modeled on Kahnawake tribe members). Are these dialect differences that important given that all Mohawk tribes were relocated by colonial powers? Does it matter which Native American tribe the actor came from? These are fun questions to debate, but ultimately unimportant. Whether the game makers sought to be “truthful” or not we must always be sensitive to how they tell the history they do. As King and Krzywinska point out: “The moment any choices are made about what material to include, how to treat it and what kinds of activities are required of players in order to succeed, particular meanings- or the potential for such meanings- are created” (172). Dean Chan, for example, argues that makers of war games justify their problematic representation of groups with authenticity claims, particularly when games reference historical events (Chan 24-30). That Arabs, Nazis, or the Viet Cong are enemies in games is simply dismissed as a realistic representation of wars the U.S. has been involved in. Focusing on a seemingly less political form of representation, Philadelphia is notably absent from AC III. As a central site of many major events during the Revolution it seems a major oversight, and as a resident of Philadelphia I was offended (briefly) at the exclusion. The designers blamed the flat, wide street, grid system plan of the city, arguing that it was too boring to navigate compared to more European-like cities of New York and Boston (Dyer). This is an important reminder of the ways design and game play choices temper the extent to which history is represented, even when representation of history is key to the narrative and mechanics of a game. The game largely sidesteps direct engagement with race to the extent dealing with it would hinder gameplay however. For example, when Connor first enters the general store he is met with more suspicion than Haytham was in the earlier part of the game. However, after Samuel Addams teaches Connor to rip down wanted posters, bribe town criers, and get the printing press to change the stories to reduce his notoriety, I’m left feeling that it is odd to assume such acts would in any way diminish Connor’s suspiciousness or the guards’ heightened alert at his presence. Visual details, like soot marks behind wall sconces or trees’ shadows on the forest floor, contrast sharply with the way Connor’s visual appearance largely does not matter in the game. The game, of course, is also actively critical of the history it represents (it’s one of the things that I enjoy about the series). The Animus database’s history of Loyalists, for example, actually offers one of the most concise critical histories of the game. Indeed much of the database attempts to paint British forces in a positive or at least sympathetic light (and it is worth noting that the NPC who writes these histories is British). Moreover, after Haytham leaves for Boston, the entry on the Atlantic Ocean in the Animus database briefly talks about European travelers before devoting a whole paragraph to African slaves’ torturous Atlantic journey. Slavery and the conflicting politics of wealthy white men demanding their freedom as they enslave others is brought up repeatedly in the dialog of the game. It’s worth pointing out, however, that this discussion of slavery in the database is followed up with a joke that belittles sexual molestation. Throughout the game there is a critique of common representations of American history that is almost always undercut by the gameplay or maladroit humor. Many of these jokes are clearly written to imply that both player and author identify with a particular type of masculinity (though note that does not require the player or author has that particular gender identity; women can laugh at sexist jokes, but they are still sexist jokes). For example, in the player’s second interaction with him, the game dialog makes light of Benjamin Franklin’s womanizing and sexist logic. Here we see most clearly that claims of sensitivity are deployed via a discourse of realism but not actually via a consistent reflection on design choices (save those for which a consultant was called to review). In addition, by focusing just on the realism of the series, the historical details, and the research involved in its creation, we miss what is most problematic and yet most telling about our view of history in the game’s narrative. Namely, that the primary conflicts of the game are those of the British and Patriots. Take for instance the moment Connor learns that the land his village sits on is being sold out from under them by the larger Iroquois nation’s agreement with William Johnson (ally of Haytham at the start of the game). His first stop after burying the hatchet in Achilles’ porch column, a Mohawk ritual for the start of a war, is Boston, where he goes through a series of missions at the behest of Samuel Addams. These ultimately lead to Connor assisting in the Boston Tea Party. What was set up as a Mohawk-centered plot line and historically reimagined revenge story makes Connor just another piece in the Patriots’ resistance strategy. The subsequent brief mission where Connor saves members of his tribe is fairly passive. Series producer Jane Raymond emphasizes of the first game that it is fiction: “there’s plenty of freedom to take revisionist approach, tweak people’s personalities and motivations” (El Nasr et al. 7).Part of the revision the game offers is by providing a critical take on the popularized versions of the histories presented. When the series moves to the American Revolution in AC III the game uses the perspective of a Native American protagonist to take a hard look at both British and Patriot arguments during the conflicts. In particular, when Connor is reunited with Haytham the game explores the sides of the war in more detail. Haytham points out that most Patriots are self-interested, wealthy, white, slave-owning landowners. Connor sides with his allies on the Patriot side until he learns of General Washington’s note to John Sullivan calling for the destruction of all Iroquois settlements. In the mission that follows, Connor is meant to stop the Kanien’keha:ka, who have sided with the British, by non-lethal means—at least if the player wishes to achieve “full synchronization.” By making this choice an option the game puts the player in an interesting position. Throughout the game the player is required to kill British Regulars in a variety of ways. In the back and forth between critiquing the British and critiquing the colonists, the player never really gets a choice as to whose behalf they fight on. When it comes to the (very) few missions that involve the Kanien’kehá:ka people, all but one death is made optional. Throughout the game, despite being a classic game hero, Ratohnhaké:ton/Connor is a tragic figure. The death of Ratohnhaké:ton’s mother at the start of the game sets the stage for an anti-colonial revenge story, the chance to reimagine struggles of this era through the eyes of a Kanien’kehá:ka hero. That, however, is not exactly what the game delivers. Connor almost always helps along history, as we know it, and is not in a position to reimagine what might have been for his people. The end of his people’s story is already written. The only thing the game illuminates is the extent of the British and Patriot atrocities against them (and even that could be discussed in more detail). The final cinematic of the game is the most telling of the tension between the narrative end goals and game actions’ goals. 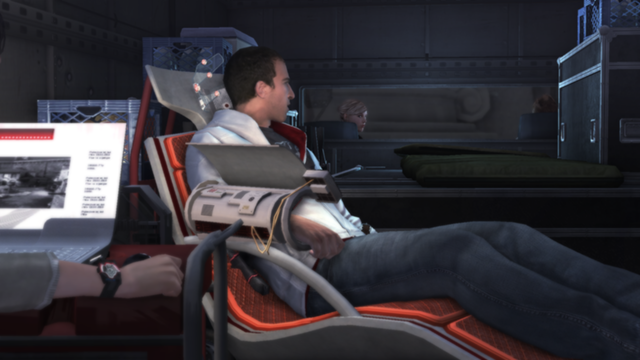 If the player is willing to sit through the nearly twenty minute-long credits, they see one final scene. Ratohnhaké:ton stands on the dock of Boston as colonists throw detritus at the retreating British ships and shout joyously of their freedom. He then turns and sees two African slaves being sold and his look reflects the hypocrisy of this new “free world” claimed by the Patriots. He has also found out that his people have been moved west after congress granted their land to a colonist. The game ends on an ambivalence that I felt as a player. All of my work in the game didn’t accomplish what I wanted to do while playing it. The ending was most certainly realistic, but why did it have to be that version of realism? The critique of realism here is not on the quality of the research or design, but rather that the focus on realism actually belies the fact that what the game reflects is a particular perspective on history that was assumed to be interesting to anticipated players. This is evident in the downloadable add-on “Tyranny of King Washington” where, as Ratohnhaké:ton in an alternate world, the player battles alongside his people and still living mother to free the land from a maniacal George Washington. In a game invested in historical detail, this anti-colonial revenge fantasy is simply not an option as the main game. Only in a hyperfictional add-on can there be a reimagined history where Native Americans could be victorious. Even then, the end result of the story is that things are returned to a normal and America stands as it always has. That is the tyranny of realism that games focused too much on questions of accuracy, rather than emancipatory possibility, must struggle to overcome. It is also indicative of the way imagined audiences over-determine the stories companies are willing to tell. If we can only imagine new ways of viewing what has been, we never get a chance to imagine what might be. El-Nasr Magy Seif, Maha Al-Saati, Simon Niedenthal, and David Milam, “Assassin’s Creed: A Multi-cultural Read” Loading… 2 (2), 2008. King Geoffrey & Tanya Krzywinska, Tomb Raiders & Space Invaders: Videogame Forms & Contexts. New York: I.B. Tauris, 2006: 172. Chan, Dean. 2005. “Playing with Race: The Ethics of Racialized Representations in E-Games,” IRIE 4 (2005): 24-30.